This CBD Cocoa Cookie is a crunchy and crisp treat great for dunking in milk or on its own! Ingredients: Organic flour, Organic cane sugar, Organic butter, CBD oil, Cocoa, Cinnamon, Egg, Vanilla extract. CBD - Anti-inflammatory, Anti-depressant, Anticonvulsant, Antipsychotic, Anti-tumoral, Anti-cancer, Antioxidant, Antiemetic, Analgesic, Anxiolytic. 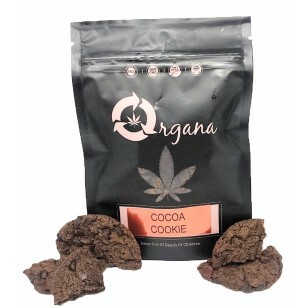 This CBD Cocoa Cookie is a crunchy and crisp treat great for dunking in milk or on its own! Each order includes one CBD cookie Dose: 50mg CBD Ingredients: Organic flour, Organic cane sugar, Organic butter, CBD oil, Cocoa, Cinnamon, Egg, Vanilla extract. CBD - Anti-inflammatory, Anti-depressant, Anticonvulsant, Antipsychotic, Anti-tumoral, Anti-cancer, Antioxidant, Antiemetic, Analgesic, Anxiolytic. Keep out of reach of children. Store in a dry, cool place.